Welcome to I Can Vote! 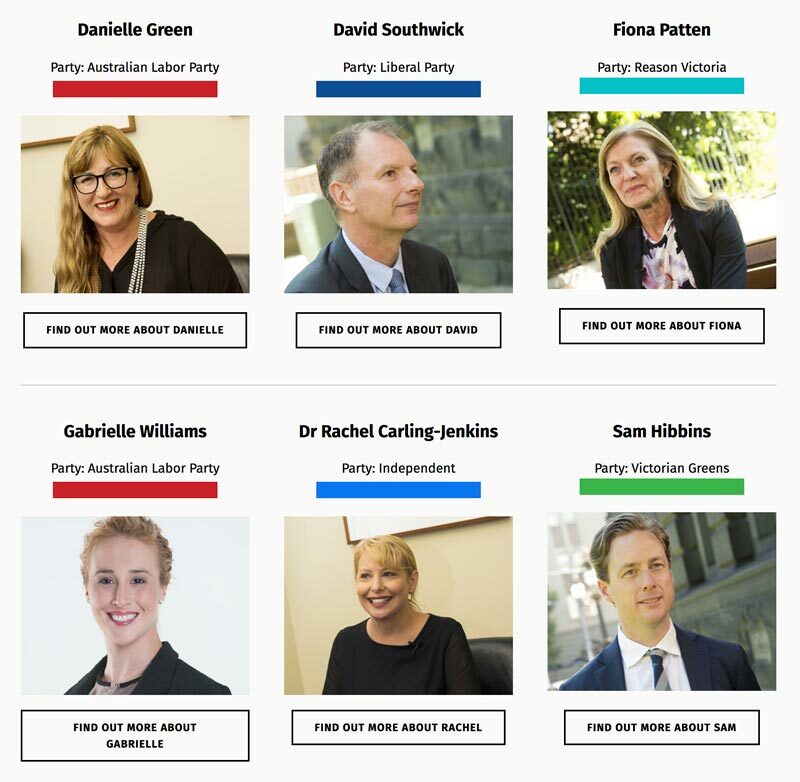 This website has information to help you get ready to vote in the Victorian State Election this November. I Can Vote has videos of the election candidates explaining what they believe and support. These videos can help you choose who you vote for. I Can Vote also has information about democracy and politics. There is also information for supporters who are helping you learn about voting. People like us, with disabilities, have a right to speak our own thoughts. I understand how voting works and why it is important. I have the right to vote just like everyone else. Voting is your chance to have a say and to make your voice heard. Being able to vote is your basic human right. Voting is your way to choose who will make important decisions that affect you. This is the time to learn about the political candidates you can vote for. Find out what they are promising and what they think is important. They can make changes that will either make your life better or worse. It’s your rights, it’s your life! My name is Suzie and gee where do I start? I think I might go from where I was. I have an acquired brain injury which has left me unable to work and with epilepsy and a whole bunch of different problems that go with that. Voting comes down to issues, I suppose the issues are important. Well I mean I find it a bit hard to make a decision. Which is part of the way that I am and sometimes the way that parties present themselves can be a bit far removed from everything local. I understand that economics side's importance to make our country move forward, but I also understand the importance of the people from being on the ground trying to deal with life. I started to vote when I was in my 20’s and it was easy when I had someone to help me to vote. The second time I went again with my support worker. That was easy. Two years ago, I was voting on my own, I lost track of time, I slept in. When I walked to the primary school, everyone had gone home, so I walked home. I then got a fine for not voting, which was very stressful. My advice to other people is if you are having trouble finding a voting centre, you can search online or ask someone for help. Everyone needs help and support. My name is Heath. I was born in Victoria in Ferntree Gully. I am a 1990 baby. I went to university after completing year 12. I went to Melbourne University and I studied architecture. I was towards the end of my bachelor when I had my car accident. I love how different parties were approaching conservation, yet, I am really not all that interested in politics. Not particularly as I’ve been brought up to do but there’s been a slight nudge along just voting on party lines. It is tricky when you have it set in your mind that you’re voting for this and you get there and read all the brochures and it turns out it’s not how you’ve got it set in your head, that’s not the actual motives of all the parties. The hardest part is the preferences. I know who number one is and I know that the rest of my preferences will probably have quite an impact. You have a right to have a say. You have a right to be heard. We can choose who becomes a politician because we live in a democratic country. Voting is a way that people can have their say about how their country is run. When you vote in an election, you are saying who you would like to represent your views when decisions are made. Learn more about how voting works in Australia. It is important to think carefully about who you vote for. Voting is our opportunity to decide who will be the best people to make decisions for us. These people become politicians. Politicians make the rules about what we can do and what we can’t do. Some political candidates have made videos to explain who they are and what they believe. These are political candidates for the 2018 Victorian State Election. You can view these videos here. The best way to learn to vote is to learn with other people! You can ask for help and you can take as much time as you need. This section of the website will help you learn how to vote. It will also help you make a plan for election day. There is also information about: enrolling to vote, learning about politics and elections and what to do on election day. Remember, you can ask a friend, family member or supporter to help you read this information. For more information on getting ready to vote. Feel free to ask a question, seek further information, or provide feedback.